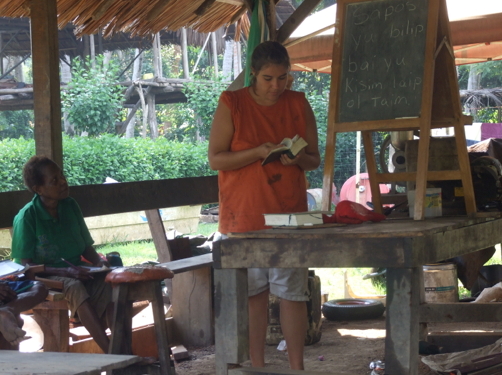 We have seen a change in focus in how we go about discipleship in Samban. We are focusing our efforts, opting to mentor a few men and women who work with us in the schools and clinic as they take leadership positions in the community. Because the Education/Literacy work has been the most extensive portion of our work that has grown in the last four years, we have made an effort to focus on the Elementary Teachers spiritual growth. With every training course for teaching, there has always been a daily devotional, as well as continued training throughout the day. Since most portions of text are scripture anyway it works out quite well! Our reasoning has been that if we can affect the teachers, then obviously the way they live and teach will affect their students. It has been extremely gratifying to see the paradigm shift in the teachers thinking and life view. 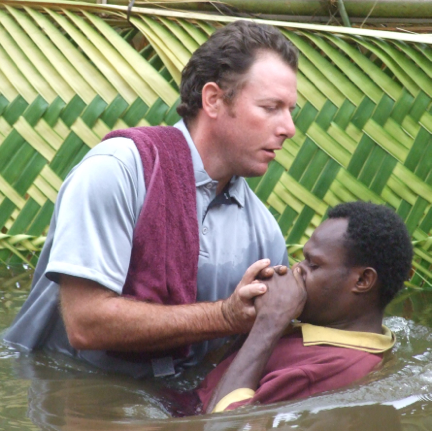 On January 1st of 2012 I (Jesse) had the honor and privilege of baptizing 3 of the 5 teachers in Samban into a new life. In one case, the teacher and his spouse were baptized simultaneously! We are so proud of these teachers! Having a staff of committed believers makes a marked difference in their attitudes towards their students, parents and work. Since we have seen the success through this avenue of discipleship we are going to continue to focus on those we work with everyday. It makes the most sense for us to teach and share with those that we work with on a day-to-day basis. We have an open door policy and have spent many late nights discussing scripture. Pray for us as we continue to teach and share that the seeds will fall on rich soil. We will also continue to maintain and nurture those programs that are already in place, women’s ministry, Sunday school and Discipleship classes. We are excited about the new pastor returning to Samban, the first of our scholarship students to pursue the ministry. His name is Jon Kanja. We are excited to have the opportunities to work together to build upon what is already in place. A. Sunday School Program- We are working to revitalize a struggling Sunday School program. We are accomplishing this by recruiting teachers both experienced and new giving them weekly training and teaching them not only to teach their students but to create and write interesting, accurate and effective lessons. B. Women's Bible Study- We are trying to identify and equip leaders to sustain this program that has been off again on again in the last decade. We also use this meeting time to teach women about preventative medicine and basic health care issues. C. Men's Bible Study- We will be trying to start this new program to strengthen men in their faith and encourage them to take positions of leadership in their homes and church. D. Discipleship Course- There has been some issues in the local church not having a stable pastor. In an effort to support them Jesse has been preaching 1-2 times a month. He has also been offering a quarterly discipleship course that is a Christianity 101 course for those considering becoming believers.